Everyone wants their smile to leave a great first impression, and a bright, white smile is the aesthetic ideal. Unfortunately, your teeth are vulnerable to discoloration, and almost everyone experiences some color changes over time. Age is to blame for many cases of yellow or brown teeth. Other culprits include popular foods and beverages like coffee, tea, wine and berries; these can leave stubborn stains. If you want to whiten your teeth, you have two options; you can buy over-the-counter products and do it at home, or you can visit your dentist for professional teeth whitening treatments. Over-the-counter teeth whitening options for use at home include whitening rinses and toothpastes, gel strips and whitening trays. Rinses and toothpastes work gradually and only expose your teeth to a small amount of bleach. Gel strips and whitening tray systems work faster, but require more application time. In-office whitening systems typically involve fitting custom-made trays over your teeth and leaving them for specified lengths of time. Some systems use a light source to enhance results. The entire process usually takes place in the dentist’s office, but professional whitening trays can also be adapted for home use. If you have healthy teeth and gums, at-home treatments may be a convenient and appealing choice. They’re easy to use and relatively inexpensive. If you have problems with tooth sensitivity, professional treatment may be the better option. Your dentist can manage sensitivity symptoms and make the whitening process more comfortable. You’ll also get faster and more dramatic results with professional teeth bleaching whitening agents. Some people shouldn’t use whitening treatments. These include pregnant women and people with gum disease or untreated tooth decay. 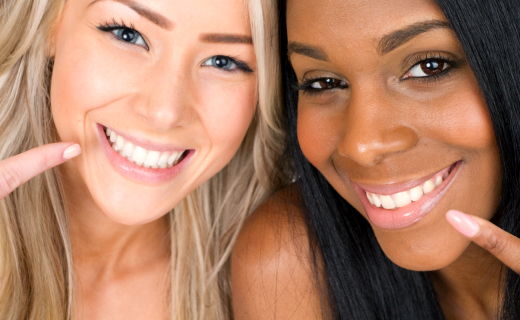 Talk to your dentist in South Bend about your teeth whitening options to find out what’s best for you. To get the dental care you deserve from an affordable dentist in South Bend, call The Dental Center of South Bend today at (574) 367-7000 or make an appointment. The Dental Center offers affordable family dentistry and gentle, compassionate dental care in South Bend. With 4 affiliated practices throughout Indiana, our offices are conveniently located with extended hours to meet your needs. At The Dental Center of South Bend, we provide most dental services, from basic preventative care and general dentistry to specialized procedures and complete dental reconstruction. We accept most dental insurance plans and offer affordable financial solutions for any budget. Patient satisfaction is our top priority and we strive to provide the exceptional, affordable dental care and personal touch that lead to lasting relationships. A smiling patient is our greatest reward and we look forward to keeping those smiles healthy, beautiful, and bright. Discover an affordable dentist who truly cares at The Dental Center of South Bend. Dr. Stakem is very kind. I have had a lot of work done lately and it has been quick and painless. Good dental care and friendly service. Teri always does a great job and is very pleasant. I feel confident in the medical care I am receiving. Scheduling fits my schedule. And appointments are on time. The staff are consistently efficient, pleasant and professional. Your office staff was friendly and helpful. I was treated like a valued guest in your office. Great customer service at the check in check out office. Great hygienist – Marge. Great dentist! Very friendly staff, will be Back! Fast appointment, for a limited exam! I had a previous concern with the numbing agent. I explained this and they were wonderful working with me and my concerns! Really a great bunch of people! The staff was friendly and efficient. Good information provided by hygienist and Dr. Patel on how to improve my already strong dental care habits. Great people. Everyone was so friendly. And great price. It was a good experience all around. The receptionist was very kind. The hygienist was very easy to talk to and informative. The dentist took the time to examine my teeth and make sure I knew the problems I was having.